Beautiful views and a visit to the gravesides of some of the holiest and most important rabbis of the last millennium. We arrive at the city of Tiberius on the shores of the Sea of Galilee where we visit the graves of several important historical Jewish figures – Maimonides, Rabbi Shimon Bar Yochai and the Baal HaNes. We make a brief stop at a diamond factory then continue on to the ancient city of the Kabalah, Safed. Here we visit the Ari HaKodosh synagogue, the Isaac Luria Visitors Center and we stroll through the Artists Quarter. Next we continue to Mount Meron and visit the graves of Rabbi Shimon Bar Yochai and Rashbi where Lag B’Omer is celebrated each year by thousands of believers. We begin by traveling north past Herzliya and Netanya up the Mediterranean coast of Israel then turn inland and travel through the plain of Armageddon where we can see Megiddo (Chronicles II 35:20-27). We reach the city of Tiberius on the shores of the Sea of Galilee. 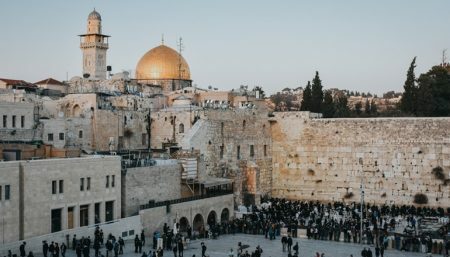 The city was established in the 1st century by King Herod and archaeological excavations have revealed structures from the Mishnah and Talmud periods (1st – 5th centuries). We visit the ancient grave sites of two esteemed sages. Rabbi Meir Baal HaNes was believed to be a miracle worker, he was one of Rabbi Akiva’s pupils and his grave is one of the most visited in the country. Although the original structure which marked the grave of Rabbi Meir was destroyed by an earthquake in 1837, two stone pillars remained marking the grave’s location. Today a new structure which was built in 1867 marks the rabbi’s grave and the two original pillars have been incorporated into the tomb. From a distance it is possible to see the distinctive blue and white domes of the tomb. At the grave site there are separate prayer areas for men and women and study areas for both Ashkenazim and Sephardim. Near the grave site are vendors selling religious souvenirs, candles, books and posters of revered rabbis. We visit the tomb of Rabbi Moshe Ben Maimon (Rambam) who penned the fourteen volumes of the important Mishne Torah and is respected as a great sage, philosopher, scholar and doctor. Ramban passed away in Egypt in 1235 and his final wish was to be brought to the shores of the Kinneret to be buried in Tiberias. We continue on to Safed, a hill top city and one of Israel’s four holy cities. 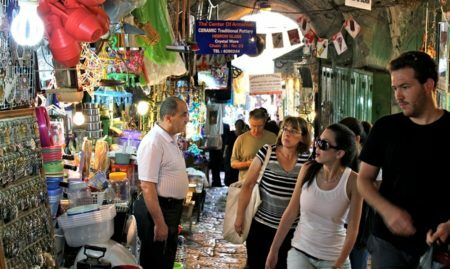 We walk through the historic city and the narrow alley ways of the Old City, we visit the Ari HaKodosh synagogue, the Isaac Luria Visitor Center and the Artists Quarter. Our next stop is at Mount Meron where Rabbi Shimon Bar Yochai (Rashbi), a 2nd century sage, is buried. Rashbi wrote the Zohar, the primary text of the Kabbalah movement. It is believed that he penned the Zohar while in hiding from the Romans following the destruction of the Second Holy Temple. Rashbi is believed to have passed away on Lag B’Omer, the same day that a plague ended which had taken the lives of Rabbi Akiva’s pupils. Rashbi’s grave is the site of Lag B’Omer celebrations each year when thousands of Jews gather there to light bonfires, dance, rejoice and also traditionally give their three year old sons their first haircut. The tomb is used for prayer both by men and women in separate areas and outside the tomb you can find stalls selling religious mementos, head coverings, religious books and artifacts. Clothing: Shoulders should be covered, shorts are not allowed. Also bring water, a sun hat and good walking shoes. This tour requires a minimum of 3 participants. The sites may be visited in a different order.